Of course, since Gameloft doesn't really do the whole "originality" thing, it looks quite a lot like existing games in the genre, namely Diablo and Torchlight. But there's only so many ways you can make a dungeon crawler, so we'll forgive them for that. Graphics and audio look pretty solid, with some nice lighting effects and big bosses. The God of Thunder himself is the only playable character shown thus far, but Fandral, Hogun, and Volstagg are mentioned, and I wouldn't be surprised to see a certain horny trickster pop up. According to the press release, there will be over 100 missions and enemies from the movie, with a story penned by well-known comic writer (and The Dark World's co-writer) Christopher Yost. 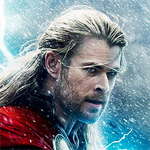 Thor: The Dark World has a vague "fall" release date, some time around the November 8th release of the movie. Things are getting better, Android gamers - at least it's not an endless runner. Paris, 22 July 2013 - Having previously teamed up to develop several successful games including The Amazing Spider-Man and Iron Man 3 – The Official Game, Gameloft, a leading global publisher of digital and social games, and Marvel are joining forces once again to bring the official game inspired from the highly anticipated new movie Thor: The Dark World to iPhone, iPad, iPod touch and Android. "Thor: The Dark World – The Official Game will allow fans of the franchise to play as one of Marvel’s most iconic Super Heroes in a game of epic scope and beauty.” said Javon Frazier, VP Games Marketing at Marvel. "With this new game, we are further expanding the successful relationship between Marvel and Gameloft." Thor: The Dark World –The Official Game will be released in conjunction with the theatrical film from Marvel this Fall.